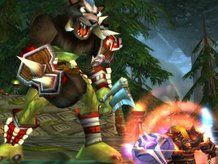 In what has to be the most obscure statistic of the day, one blogger has worked out the physical size of World of Warcraft's Azeroth – and found out that it's the same size as Newcastle. James Wallis used his time on WoW to decide that the total landmass in Azeroth is approximately 113 square kilometres which, he explains, is about the same as Newcastle or the London Borough of Hillingdon. "The longest straight, flat line that an adult human can walk in Azeroth without being interrupted by obstacles, mobs or the Horde stretches from the eastern end of the north parapet of the bridge into Westfall, across Elwynn Forest to the southernmost of the Three Corners in Lakeshire, says the blog. "An adult human walking at a steady pace will cover this distance in 18 minutes and 15 seconds. Humans walk at an average speed of 5.6 kilometres (3.5 miles) per hour, and therefore this route is roughly 1.7 kms (1.05 miles) long. "Extrapolating this to the whole of the Eastern Kingdoms, and using the best maps available, the continent is 5.8 kms by 14.25 kms (3.6 x 8.85 miles) and Kalimdor is Kalimdor is 7.3 kms x 14.75 kms. Taken together, the two main continents have a combined area of approximately 113 square kilometres." Wallis goes on to point out that this would put the total diameter of the planet at 12 kilometres, which would mean it should probably have a lot less gravity than the moon.